Discuss the escalation of American involvement in Vietnam from 1960 to 1968. Why did the USA ultimately fail to defeat the North Vietnamese and Vietcong. In 1960, Kennedy was elected as the new president of the United States. As the Cold War raged, Kennedy had ascended to power with the attitude that Americans would "pay any price, bear any burden, meet any hardship, support any friend, oppose any foe, in order to assure the survival and success of liberty." Kennedy was not one to back down from a fight or to allow the name of his country to be soiled. 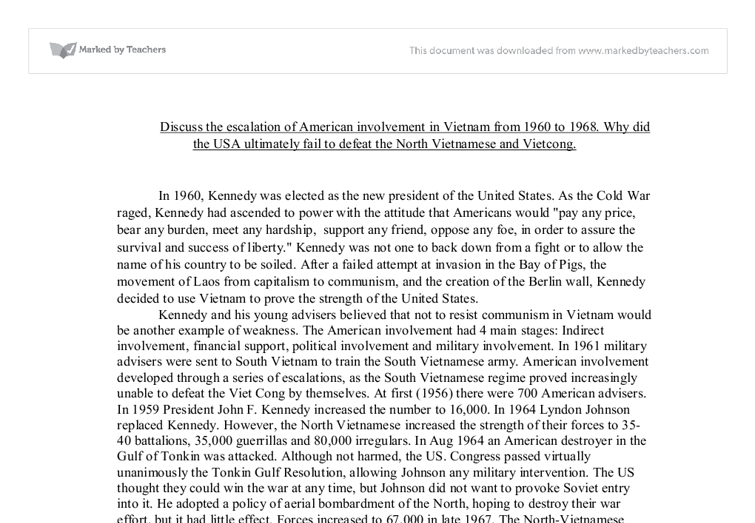 After a failed attempt at invasion in the Bay of Pigs, the movement of Laos from capitalism to communism, and the creation of the Berlin wall, Kennedy decided to use Vietnam to prove the strength of the United States. Kennedy and his young advisers believed that not to resist communism in Vietnam would be another example of weakness. The American involvement had 4 main stages: Indirect involvement, financial support, political involvement and military involvement. In 1961 military advisers were sent to South Vietnam to train the South Vietnamese army. American involvement developed through a series of escalations, as the South Vietnamese regime proved increasingly unable to defeat the Viet Cong by themselves. ...read more. When the French exited Vietnam by 1954, the U.S. was quick to step in to begin taking control of South Vietnam. As an excuse to justify American intervention in Vietnam, President Dwight D. Eisenhower introduced the Domino Theory. This theory explained that if South Vietnam fell to communism, this would result in all of Southeast Asia doing the same. As we know now, the Domino Theory turned out to be false and inaccurate. The U.S. government also feared that the eventual spread of communism could potentially lead to the United States and influence Americans. USA thought that if they help South Vietnamese, it would help to defeat communist North Vietnam. They chose Ngo Dinh Diem to be president of South Vietnam. However, choosing Diem as the ruler was one of the biggest mistakes made. His religious persecution against Buddhists, who were the majority of civilians, quickly alienated the population. A devout Catholic, Diem's self-righteous outlook caused him to do more harm than good. His destruction of several ancestral graves of Buddhist enemies, for example, ignited the flame for mistrust in the government and only furthered the Vietnamese view of Americans as selfish imperialists. ...read more. The government did not stop the showing of images of the war to the people USA, yet this led to the creation of anti-war movements. A lot of people started to doubt the tactics of US in Vietnam. As more dead bodies came back to US, people stopped believing that US has a chance to win this war. People were worried, that it's not worth sacrificing so much for a small, unknown country like Vietnam. The soldiers that came back from Vietnam felt guilty about the damage they did and the number of people they had to kill. US government was under the pressure from people, yet couldn't do anything to stop the war quickly. It failed to further keep the reasons for US intervention justified. 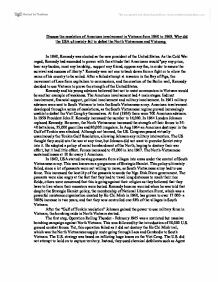 The US involvement in Vietnam grew between 1961 and 1968 through military involvement and the increasing number of troops that were sent to Vietnam. Despite the technology and size of army that US had, they lost the war for a number of reasons. US was using wrong tactics, soldiers were not prepared to fight in the jungle, supply routes were too long and eventually there was a strong opposition to war in USA. US troops fought against an enemy that simply refused to lose. ...read more. The Viet Cong, however, had been using this tactic against the Japanese and French previously, and so were well practised at it. The American troops' morale was also low as they were getting defeated by an enormously weaker foe and they were always on edge, due to the guerrilla tactics of the Viet Cong. Source I is useful as it is from a text book and it has been made to tell people about the Ho Chi Minh trail; it would also be reliable because it was by a historian and they would have researched it. My next point is the problems with US morale, attitude of service men and the idea of one year tour of duty. The American attitude at the beginning was very confident, because they thought they could walk all over the VC, blatantly they did not and this could be due to the overconfidence. Despite America's constant attempts to cut off this crucial link by means of bomb raids and defoliation, the Ho Chi Minh trail remained strong and effective. The Viet Cong had also constructed a vast and complex network of underground tunnels stretching for hundreds of miles and linking entire districts. The soldiers were ordered to undergo 'Search and Destroy' missions. This meant that they storm into one area or a village and clear it. They then left and moved onto another area or village. Combat troops were often sent via helicopter, even while mulitple During the Vietnam war, the USA, was struggling to defeat North Vietnam and the Viet Cong. Communist guerrillas hiding in villages, but often resulted in innocent civilians being attacked and having their houses and crops destroyed as collateral damage. The use of chemical defoliants was also very damaging as they were found later to be carcinogenic and America?s indiscriminate bombing seemed only to alienate the South Vietnamese rather than win other their ?Hearts and Minds?.